These Terms and Conditions of Use are legally binding. It is your responsibility to read these Terms and Conditions of Use carefully prior to purchase, use or access of any of our programs, products, services, courses, program materials or other digital products. These Terms and Conditions apply to ALL Creative LLC Products, Services, and Online Courses. All programs, products, courses or services are owned and provided by Curb Creative LLC (“Company” or “we” or “us” or “our”). The term “you” or “your” refers to any user or purchaser of said program(s), product(s), course(s), or service(s) (the “Offering”). These Terms and Conditions of Use (“Terms”) govern and define how you are allowed to use and access Company’s Offering. We reserve the right to update and change these Terms at any time, and will update them accordingly with the ‘date last updated’ at the top of this page. You are legally bound to these Terms whether or not you have read them. If you do not agree with any of our Terms, please email us at Support@CurbCreative.comand we will make reasonable efforts to remove your name, email and access to our Offering and website(s). When you purchased an Offering from us, you were given a reasonable notice that these Terms existed. By moving forward with your purchase of the Offering and further access of the Offering, you agreed and continue to agree to abide by these Terms as well as any disclaimers and privacy disclosures contained in these Terms. You agree you are at least 18 years old or of legal age in your applicable jurisdiction to access the Offering. Access of our Offering(s) and related materials by a minor is a violation of use, and we reserve the right to terminate your access if such an issue is discovered. Limited License: Subject to and in accordance with these Terms and other guidelines or instructions we include in the Offering, we grant you a limited, non-transferable, non-sublicensable, non-exclusive, revocable license (“License”) to make individual use of the Offering, including any courses purchased by you. Your purchase of any Offering only entitles you to view that Offering in accordance with the foregoing License, and is not a purchase of the software or content constituting or included in the Offering. More specifically, unless explicitly authorized in these Terms or by the owner of the materials, you may not modify, copy, reproduce, republish, upload, post, transmit, translate, sell, create derivative works, exploit, or distribute in any manner or medium (including by email or other electronic means) any material from the Course(s). You may, however, from time to time, download and/or print one copy of the individual pages of the Course for your individual use, provided that you keep intact all copyright and other proprietary notices. Fees: Fees for Offerings are set forth on the Website. We reserve the right to change Offering Fees at any time. Refunds: Due to the fact that our Offerings are digital, they cannot be returned or exchanged. We cannot issue refunds after the purchase is made. Please be sure to review the Offerings demos, features, overviews, the FAQs, support, and any other information provided required prior to purchasing. Exception: We have reserved the right to make an exception specifically for Online Courses. We want you to be satisfied with your purchase but we also want you to give your best effort to apply all of the strategies in the Course. We offer a 15-day refund period for purchases of Courses. However, in order to qualify for a refund you must submit proof (as detailed below) that you did the work in the course and it did not work for you. In the event that you decide your online course purchase was not the right decision for you or your business, within 15 days of enrollment, contact our support team at Support@CurbCreative.com and let us know you’d like a refund by the 15th day at 11:59 EST. You must include your coursework with your request for a refund. If you request a refund and do not include your coursework by the 15th day, you will not be granted a refund. All refunds are discretionary as determined by Curb Creative LLC. We will NOT provide refunds more than 15 days following the date of purchase. After day 15, all payments are non-refundable and you are responsible for full payment of the fees for the program regardless if you complete the program. Please note: If you opted for a payment plan and you do not request a refund within 15 days, and attach the required complete coursework as outlined above, you are required by law to complete the remaining payments of your payment plan. Recurring Payments: If you have signed up for a payment plan, you hereby authorize our continued access to your financial information stored by our third party financial processing company referenced in this Agreement until your payment plan is complete, as set forth in your acceptance of the purchase terms upon checkout. Late Payments: If payments are not made on time, you agree to pay interest on all past-due sums at a rate of 1.5% per month or the highest rate allowed by law, whichever is greater. Chargebacks: You agree to make every attempt to request a refund prior to attempting a chargeback with your financial institution. In the event of a chargeback attempt, you expressly agree to forfeit any and all of our bonuses, affiliate bonuses or other materials afforded to you in exchange for your original purchase of our Offering. We reserve the right to present proof of your access and these Terms to the financial institution investigating the dispute. You have the unilateral right to terminate your use and access to any of our Offering(s). Please send an email to Support@CurbCreative.comto initiate this process. Termination will not excuse you of further payment. Upon confirmation of your termination, any and all outstanding balances will become immediately due and payable. Any existing balance that remains after 14 days from the date of termination will be sent to a collections agency, and you agree to be responsible for any additional charges, fees or costs associated with such a collection effort, including but not limited to reasonable attorney’s fees and court costs. All images, text, designs, graphics, page layout, icons, videos, logos, taglines, trademarks and service marks are owned by and the property of Curb Creative LLC or the properly attributed party. It is a violation of federal law to use any of our intellectual property in whole or in part, and modification of any materials contained on provided in the Offering is illegal and may be prosecuted to the fullest extent permissible should we choose to do so, including seeking financial penalties (damages) and/or an injunction forcing you to stop using our intellectual property immediately. Use our trademarks and copyrighted materials with our prior written consent and proper credit and marking, namely, citing ©Curb Creative LLC as the source of the materials and marking any federally registered trademarks with ® or common law trademarks with ™. 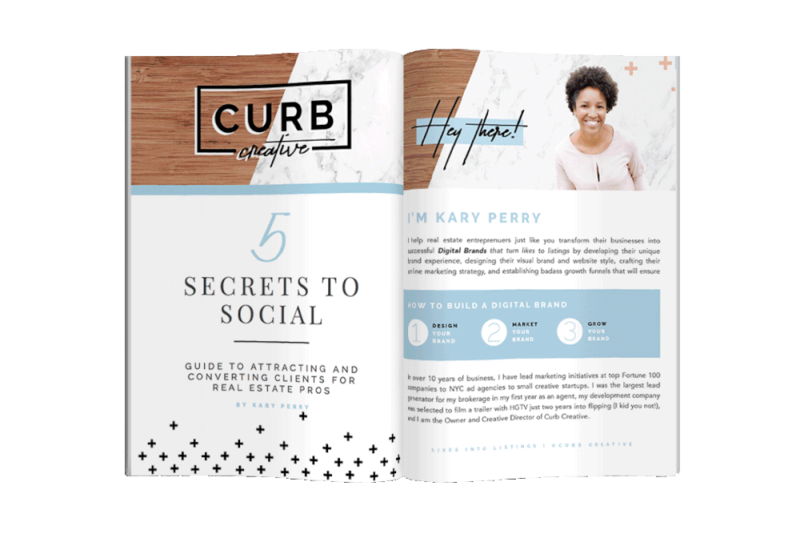 Request for Permission to Use Content: If you wish to use, publish or refer to any of our content, Offering(s) or related materials, you must do so by requesting permission prior to commencing use of the same by email us at Support@CurbCreative.com. Permission is not granted until you receive such permission in writing. Civil and Criminal Penalties: Even though our Offerings are not physical property, you can be charged with theft or other face civil or criminal penalties if you copy, steal, infringe or otherwise violate these Terms. We reserve the right to prosecute infringers to the fullest extent allowed by criminal or civil statute in any jurisdiction allowed. You explicitly consent to personal jurisdiction in Georgia by opting into or purchasing any Offering or accessing its related communications and/or materials. Your Materials and Contributions: By submitting a comment, photo, video or other material(s) onto any website or platform owned or maintained by us, including but not limited to the online software platforms that we use to distribute our Offering and related materials, you agree that we have a non-revocable, commercial license to republish your submission in whole or in part unless you explicitly state that we may not do so with said submission. You have no right to privacy by accessing our Offering(s) or related materials, and we reserve the right to disclose your participation in the same. Model Release: You must own the copyright to any image(s) you use in our Course or related materials. You grant us a commercial license to any image(s) you submit to us by default, such as a Facebook profile photo or other profile image you voluntarily provide in accessing the Course, or that you provide voluntarily upon our request. Such a default or voluntary release of your image and likeness may be used for any reasonable future business use. Notification of Use: We are not obligated to notify you or anyone of our use in our own publications of photographs or other images that you submit to us by default or voluntarily. Security: It is your responsibility to secure your username and password from theft or any other means of unauthorized use that would violate these Terms and Conditions of Use. We do not store any whole credit card numbers or payment information, and instead, these are processed through third party processors such as Stripe or Paypal. By utilizing these payment processors to gain access to the Offering, you indemnify us and instead assume any and all risk or liability for the security of the payment details, and agree to be bound by the third party payment processor’s applicable terms and conditions of use. Confidentiality: You have no right to confidentiality unless otherwise explicitly stated, such as in a subsequent client agreement, or otherwise implicitly agreed upon as mandated by law or fiduciary duty. Assumption of Risk:By accessing our Offering(s) and/or related materials, whether paid or unpaid, you assume all the risk of your access and any subsequent actions you choose to take as a result of the influence, information or educational materials provided to you. General Disclaimer: To the fullest extent permitted by law, we expressly exclude any liability for any direct, indirect or consequential loss or damage incurred by you or others in connection with our Offering(s), including without limitation any liability for any accidents, delays, injuries, harm, loss, damage, death, lost profits, personal or business interruptions, misapplication of information, physical or mental disease, condition or issue, physical, mental, emotional, or spiritual injury or harm, loss of income or revenue, loss of business, loss of profits, loss of contracts, loss of anticipated savings, loss of data, loss of goodwill, wasted time and for any other loss or damage of any kind, however and whether caused by negligence, breach of contract, or otherwise, even if foreseeable. We are not medical, legal, financial or other professionals, or if we are, during the terms of this Offering and related material(s), we are not offering our professional services and you expressly agree we are not acting in any professional capacity, including medical, legal, financial or otherwise during the term of this Offering. This Offering is for educational and entertainment purposes only. None of the Offering or its related material(s) should be construed as medical, legal, financial advice. Earning Disclaimer: While we may reference certain results, outcomes or situations on this website or its related communications, you understand and acknowledge that we make no guarantee as to the accuracy of third party statements contained herein or the likelihood of success for you as a result of these statements. You agree that you understand that individual outcomes will vary. We cannot guarantee your success merely upon access, purchase or completion of of our Offering(s). Any results you see on are not guaranteed or typical. Third Party Disclaimer: You acknowledge and agree that we are not liable for any defamatory, offensive or illegal conduct of any participant or user of our Offering(s), including you. Warranties Disclaimer: WE MAKE NO WARRANTIES AS TO OUR PROGRAMS, PRODUCTS, SERVICES, COURSES OR PROGRAM MATERIALS. YOU AGREE THAT PROGRAMS, PRODUCTS, SERVICES, COURSES OR PROGRAM MATERIALS ARE PROVIDED “AS IS” AND WITHOUT WARRANTIES OF ANY KIND EITHER EXPRESS OR IMPLIED. TO THE FULLEST EXTENT PERMISSIBLE PURSUANT TO APPLICABLE LAW, WE DISCLAIM ALL WARRANTIES, EXPRESS OR IMPLIED, INCLUDING, BUT NOT LIMITED TO, IMPLIED WARRANTIES OF MERCHANTABILITY, FITNESS FOR A PARTICULAR PURPOSE, AND NON-INFRINGEMENT. WE DO NOT WARRANT THAT THE PROGRAMS, PRODUCTS, SERVICES, COURSES, OR PROGRAM MATERIALS WILL BE FUNCTIONAL, UNINTERRUPTED, CORRECT, COMPLETE, APPROPRIATE, OR ERROR-FREE, THAT DEFECTS WILL BE CORRECTED, OR THAT ANY PART OF THE WEBSITE OR CONTENT ARE FREE OF VIRUSES OR OTHER HARMFUL COMPONENTS. WE DO NOT WARRANT OR MAKE ANY REPRESENTATIONS REGARDING THE USE OR THE RESULTS OF THE USE OF OUR PROGRAM, PRODUCT, SERVICES, COURSES OR PROGRAM MATERIALS IN TERMS OF THEIR CORRECTNESS, ACCURACY, TIMELINESS, RELIABILITY OR OTHERWISE. Technology Disclaimer: We make reasonable efforts to provide you with modern, reliable technology, software and platforms from which to access our Offering(s) and related material(s). However, in the event of a technological failure, you accept and acknowledge our lack of responsibility for said failure, and while we will make reasonable efforts to support you, some technological issues are far outside our control and will require you to access support from a third party provider, where We host our Offeringsw. Indemnification: You agree at all times to indemnify and hold harmless our Company, as well as any of our affiliates, agents, contractors, officers, directors, shareholders, employees, joint venture partners, successors, transferees, assignees, and licensees, as applicable, from and against any and all claims, causes of action, damages, liabilities, costs and expenses, including legal fees and expenses, arising out of or related to our Offering(s). Limitation of Liability:Curb Creative LLC and its affiliates, officers, employees, agents, partners, and licensors shall not be liable to you for any direct, indirect, incidental, special, consequential or exemplary damages, including damages for loss of profits, goodwill, use of data or other intangible losses, resulting from or incurred in connection with your use of our Offering(s). We do not assume liability for any third party conduct, accidents, delays, harm or other detrimental or negative outcomes as a result of your access of our Offering(s) and related material(s). Dispute Resolution: You agree to notify the Company of any concerns or issues regarding the Offering, and to give the Company an opportunity to resolve those concerns or issues. If you and our Company cannot find a resolution to a dispute or potential claim by means of good-faith negotiation, then you explicitly agree to make a reasonable attempt to resolve any such dispute through Alternative Dispute Resolution or Mediation before filing a civil cause of action. If a civil cause of actions is filed by or against the Company related to the Offering(s), the laws of Georgia shall apply. Non-Disparagement: If you are found to be slandering, libeling or otherwise disparaging our Company, Offering(s) or related materials, you will be immediately removed from the Offering(s) and any related communications. We reserve the right to file a civil claim of action against you for any such damaging actions you take that materially harm our Company. Derivative Data:Derivative data is information that our servers automatically collect about you when you access our website, such as your IP address, browser type, the dates and times that you access our website, and the specific pages you view. If you are using a mobile application, our servers may collect information about your device name and type, your phone number, your country of origin, and other interactions with our application. Other data:On occasion, you may give us additional data in order to enter into a contest or giveaway or to participate in a survey. You will be prompted for this information and it will be clear that you are offering this kind of information in exchange for an entry into such a contest or giveaway. Advertisers:We may use third party advertising companies to run and manage our ads, such as Southern Sass Group, LLC DBA System Envy to produce ads that appears when you visit our Website or mobile app. These companies may use information about your visit to our website and other websites that are contained in web cookies (as described below) to offer you personalized advertisements about goods and services that might interest you. We cannot control the activities of such other advertisers or web sites. You should consult the respective Privacy Policies of these third-party advertisers for more detailed information on their practices as well as for instructions about how to opt-out of certain practices. We offer the opportunity for you to volunteer certain information to us that is used for email and marketing purposes. This information includes, but is not limited to, your name and email. You will have an opportunity to unsubscribe from any future communications via email, but we reserve the right to maintain a database of past email subscribers. We reserve the right to use this information as reasonably necessary in our business and as provided by law. Your information will be shared with reasonably necessary parties for the ordinary course of conducting our business, such as through Facebook ads or Google Pay Per Click marketing campaigns. We do not ever sell your information to third parties. All rights not expressly granted in these Terms and Conditions of Use or express written here are reserved by Company.